Blueberry season is upon us, and they’re so good baked into muffins, in a cobbler, or simply folded into pancakes. Still, they’re best and at their most nutritious fresh, and this breakfast smoothie is the perfect way to enjoy one of summer’s most delicious treats. High in fiber, nutrients, and antioxidants, blueberries are an excellent way to deliciously incorporate a superfood into your diet, and while other super-foods like spinach, kale, and soy can be delicious, blueberries are for sure a crowd pleaser. We all know that breakfast is the most important meal of the day, but unless it’s easy, it’s often skipped. This breakfast smoothie has the benefit of all the nutrients you need: fiber, vitamin c, protein, calcium, and omega 3 fatty acids. Still, most important, it’s delicious. All the nutrients in the world are not going to be able to overcome taste, which this smoothie delivers in spades. I love making smoothies in the morning, because they’re a quick and easy way to get more fruit into your diet and they’re portable, so even if i’m in a rush, I can make it and take it with me to brighten up my morning commute. The greek yogurt in this smoothie makes for an extra thick and creamy drink, but if you like it thinner, simply adjust your milk to yogurt ratio. I’ve also made this smoothie completely vegan by using soy yogurt (or no yogurt at all, and soy or almond milk. Freezing the fruit beforehand makes it just as thick and delicious. Peaches and blueberries are a classic combination in pies and cobblers, but here in this smoothie, you get the classic combination of flavors, but in a fresh and nutrient filled drink. I love the floral sweetness of the honey, but if you’re watching your sugar, you could as easily omit it, and the flaxseed just boosts nutrition, but protein powder or chia seeds could just as easily be substituted to personalize your nutritional needs. The real star of this smoothie is the blueberry. The colors of the smoothie really benefit from the deep hues of the fruit and the familiar flavor is comfortingly surprising. 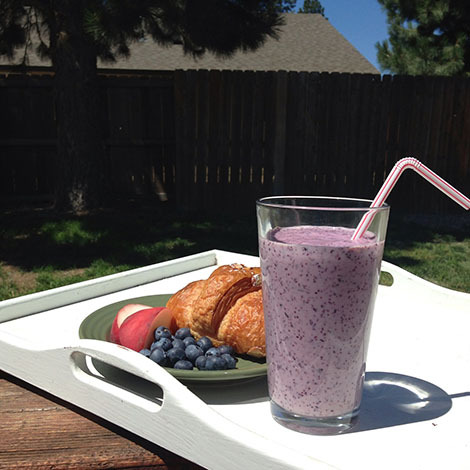 This smoothie is sure to be an easy addition to your busy mornings. Place all ingredients in blender starting with milk and yogurt. Having your liquid at the bottom of the blender will encourage smooth uninterrupted blending. Serve in chilled glasses, and enjoy! Wallpaper Wednesday: Peaches in the orchard!